I became vegan about two months ago. I don’t really miss many things since I find perfectly tasty substitutes, but yesterday night I found myself craving alfredo sauce (maybe it’s the cold weather). Since I have seen some vegan recipes on the blog, I wondered if you had any ideas as to how I can have alfredo sauce without dairy? You’ve come to the right place, Shannon! Although I am not vegan, I love vegan cooking — it is creative, healthy, and always offers a new experience for the tastebuds. 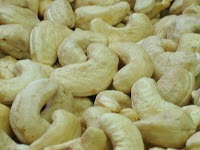 Place cashews in food processor. Pulse for 20 – 30 seconds. Add water and pulse until cashews and water are evenly mixed. Combine rest of ingredients in food processor until blended. For me, nutritional yeast is hard to find. So many vegan recipes that imitate cheese/dairy require it, though. While we’re on the topic of vegan cooking…do you know a good substitute for nutritional yeast, ruling out those soy cheese products? They are expensive and seem pretty junky. Nutritional yeast has such a distinct flavor that it is hard to find a substitute. Best bet is to order it online, really.